This is the perfect starting point for your journey in Scandinavia and the Arctic. Norway boasts the some of the world's most stunning scenery and views that will paint your travel as you hop on the famous Flam Railway, and cruise along the Naeroy Fjord by boat. Once you arrive, take your time to explore the beautiful city of Bergen - surrounded by mountains, fjords and colourful wooden houses. This is Norway in a Nutshell! Looking to extend you stay? Enquire about our 4 or 6-day Norway in a Nutshell Packages. Consider spending an extra night in the picturesque city of Flam, where you can either see the city sights or take a Heritage Fjord Safari. Combine your Norway in a nutshell package with a Scenic Hurtigruten coastal cruise to Trondheim or Kirkenes. Visit Lofoten, one of the hidden secret places on earth the spectacular archipelago in the northern part of Norway is famous for its midnight sun, northern lights, sea and mountains. Once you have arrived in Oslo, you will make your own way to your hotel of choice. If you don’t mind travelling by train, the airport train is a cheap and convenient option that takes you to the city centre. If trains are not your preferred method of travel, taxis are also available. The afternoon is spent at your leisure to explore this beautiful city. After breakfast, make your own way to Oslo Central Station to commence one of the world’s most scenic rail journeys and the first part of a your ‘Norway in a Nutshell’ tour. Your bags will be transferred for you from your Oslo Hotel to your Bergen Hotel while you travel through some of the most magnificent landscapes of farmland, forests and glacier-capped mountains before arriving in Myrdal. Here you will board the Flåm Railway, one of the best rail journeys in the world, and a marvel of railway engineering. After descending down the Flåm Valley, you will arrive in the picturesque village of Flåm. You will have some free time before your ferry journey along the stunning Naeroy Fjord from Flåm to Gudvangen. Disembark in Gudvangen and board the regular coach for the journey to Voss, passing waterfalls and some superb views of the valley. In Voss, you board the train for your last leg to Bergen and arrive in the evening. This morning your tour will end and you’ll carry on with your own arrangements. 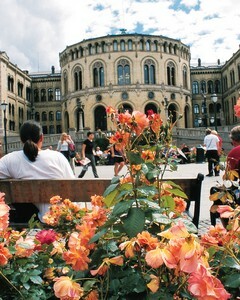 Your baggage will be transferred by Porter from your hotel in Oslo to your hotel in Bergen. There are no transfers included in this package and you will need to make your own way to and from your hotel of choice. Please ask our consultants who can advise you on the best mode of transport for you to reach your destination.